Easy Vegan Smoky Red Lentil Stew - soooo yum! Okay, so last recipe post I raved about how it was basically summer and we should be eating ALL the summer things. And yes, I agree, stew is not your typical summer dish because it's hot, and who wants a bowl of steaming hot smoky lentil stew when it's 90 degrees outside. So, yes even though it's summer, I'll still be eating big bowls of hot smoky red lentil stew because it's delicious. I'll just have to crank up the A/C while I devour it. So please join me with a nice bowl of smoky red lentils and let's sweat it out together because that is what friends do, okay? It's really really tasty. With smokiness from the paprika, slight sweetness from the red lentils, and so much hearty goodness from the kale and potatoes.. this is an all around fulfilling meal. So easy to make. Lentils don't require soaking which is a WIN! Perfect for last minute dinner plans or for those in-a-rush moments where you forget to soak the beans the night before. No problem - make lentils! It's a good-for-you-stew. Lentils are loaded with protein, fiber, and are a good source of iron and vitamin B6. Plus it's got a bunch of other good for you stuff like carrots, potatoes, and kale! Alkalizing to the body. Lately, we've been moving away from beans and eating more lentils because of their alkalizing effects in the body. Alkaline environments make it harder for disease and bacteria to thrive in the body, which is why some people avoid acid-forming foods such as beans. Lentils are a great alternative. Straight up comfort food. Sometimes, even in the middle of summer, you need a nice big bowl of comfort food. This lentil stew gives you al the heart-warming feels. Red lentils are a bit different than your typical, and more commonly known, green lentils. For one, red lentils are a bit sweeter and nuttier than other lentils. This is one of the reasons why I LOVE them. They add this slight sweetness to any savory dish- so yum! Who else is a fan of that sweet/salty combo? Another distinction is the fact that red lentils tend to break up more than regular lentils. Red lentils don't really hold up their shape, instead they turn into this creamy consistency which is great for stews and curries. The real winner in this smoky red lentil stew is - wait for it - smoked paprika! You can definitely make this stew without it, but then it wouldn't be a 'smoky' red lentil stew. It would just be red lentil stew, which is still perfectly fine and delicious, but if you can find some smoked paprika, I urge that you do. The subtle hint of smokiness mixed with the slight sweetness of the red lentils makes this dish a winner in my book. Plus, then you add all the awesomeness from the spices (garlic and onions) plus carrots, potatoes (sweet potatoes also work), and kale - well you've just got yourself an amazing dinner on your hands that will be ready in 30 minutes give or take. The hearty quinoa is totally optional. 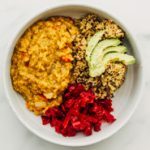 I like to serve this vegan smoky lentil stew with a side of quinoa for the added calories and nutrition from the hearty quinoa, but feel free to skip the quinoa altogether and just serve yourself a big bowl of stew alone. avocados - throw some slices on top and you're golden! sliced red onions and olives - add a bit of extra zing with these two. sauerkraut - because 'kraut goes well with anything really. Learn how to make sauerkraut at home with this easy sauerkraut recipe. mixed green salads - you can use red lentils to boost up your salads. with crackers or bread on the side. You really can't go wrong. The options are endless and are completely yours. Enjoy this red lentil stew however way you prefer, and don't forget to come back and let me know how yours turned out! Want to see more easy vegan dinner ideas? Check out this garbanzo bean soup, red kidney bean soup, or this buffalo cauliflower casserole which has been a BIG favorite on the blog. 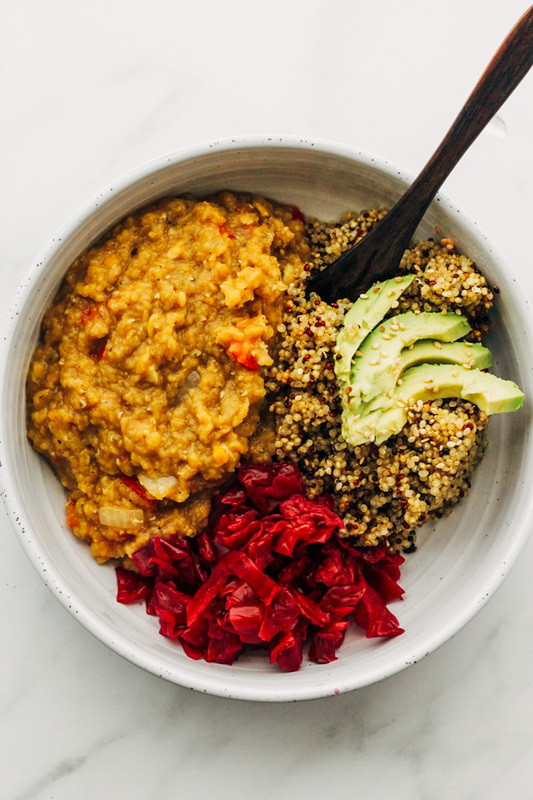 A tasty vegan smoky red lentil stew with hearty quinoa – a perfect weeknight dinner idea. Loaded with carrots, potatoes, and kale. Sautee the veggies: Pour 1/4 cup of vegetable broth into a saucepan over medium heat and add chopped yellow onions, minced garlic, chopped red bell pepper, and chopped carrots if using. Bring to a slow simmer. Cook until soft and fragrant, around 10 to 15 minutes. Using a deep saucepan – add dry lentils, 2 cups of vegetable broth and 2 cups of water. You can also use 4 cups of water if you do not have vegetable broth on hand. Bring to a gentle simmer over low/medium heat with lid tilted. After 10 to 15 minutes – add chopped potatoes, kale, sauteed veggies (onion, garlic, red bell pepper and carrots) and spices (garlic powder, onion powder, smoked paprika, salt and pepper) to the red lentils. Mix to combine and continue to simmer for another 10 to 15 minutes, or until desired tenderness is reached. The longer you simmer it for – the drier and thicker the consistency will be. If your stew is drying up too fast and your veggies are still uncooked – don’t be afraid to add more water/veg broth to allow a longer cooking time. Also, try bringing down the heat if the liquid is evaporating too quickly. First Method: If serving with quinoa as a side – bring 1 cup of dry quinoa and 1 1/4 cup of water to a boil then reduce heat to a low simmer with tilted lid for 15 minutes, or until all water has been evaporated. Add a pinch of salt to taste. Second Method: If you want to add mushrooms to your quinoa – I use this method often when I am trying to save some time. Add about 1/4 cup of vegetable broth to a deep saucepan over medium heat. Add chopped baby bella mushrooms (make sure there is enough veg broth to coat all mushrooms), cook over medium heat for about 10 minutes until mushrooms are semi-soft, and then in that same saucepan without removing the mushrooms or the liquid, go ahead and add 1 cup of dry quinoa and 1 1/4 cup of veg broth (or water). Increase the heat to bring it to a boil, and once it reaches boiling point, bring heat back down and continue to simmer until quinoa is soft and all of the liquid has evaporated. This way the mushrooms will continue to cook while the quinoa also cooks, and you end up with a nice quinoa-mushrooms combo! Add a pinch of salt to taste. 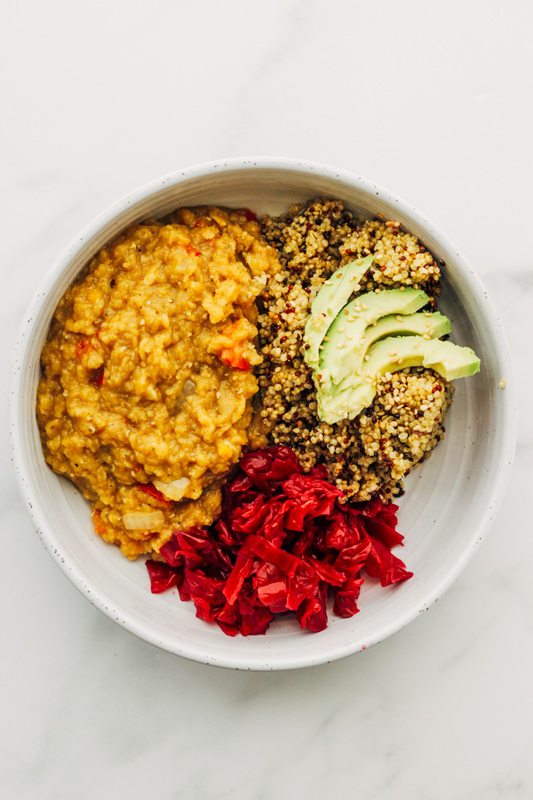 Serve smoky red lentil stew with a side of hearty quinoa and add extra toppings such as avocado, sliced onions, olives, mushrooms, and/or sauerkraut for an extra boost. Enjoy! Lentils do not require soaking. It is recommended that you examine, sort, and rinse lentils well before using. Quinoa is totally optional, so are the mushrooms.